Piracy is a nasty, dirty habit and nice needleworkers and scrappers don't pirate other folks' work. Great side, I have postet a link to you on my main page. Congratulations on the blog. I believe it's a reference when it comes to piracy on digiscrapping. I would like to mention that I have translated a couple of posts to Portuguese to educate Brazilian scrappers on a community (Digiscrappers Brasil). Hope you guys don't mind my translations. I think it's very important that we educate all scrappers around the world, and for those who don't read English, I think we should go for translations, right? 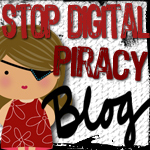 Great info, I am added your stop piracy blog to our scrapbook sites toolbar at cropalatte.net , thanks for all the great info. An EXCELLENT Website! You have been linked from all my webpages! Keep up the great work and thank you! More scrapbookers need to know this information. I've included it in this round of the Digital Scrapbooking Blog Carnival posted at Scraps of Mind on 2 Jan 2008. Down with the pirates!! Well then what does that make us? Anti pirates? Either way Viva La scrapbooking! Today my 4shared account was pirated with the help of 4shared. 4shared allowed someone to file an abuse complaint against one of my files and then changed the account name and password. My links all went back to the account but it was in someone elses name,, thanks to 4shared. I have the full story so far on my blog. I don't know what to do about this since 4shared won't reply to me. I suspect that if they are replying then it is to this person who has stolen my account. thank you for this wonderful site. Very useful. I have put your banner in my blog. Love it. thanks again for the good work.